A method to measure the hardness of fish cake patties was developed and applied as a predictor of process behaviour. 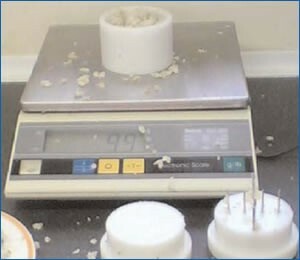 A method was needed to measure objectively the texture of the fish cake mix before reaching the forming stage - the critical point for optimum processing texture. FTC technologists worked with the customer to identify key CQP’s and variables within the production process. It was established that the best point to control the physical texture of the finished cakes would be at mixing when water was added to the cake blend. The FMBRA dough pot set traditionally used in the preparation of biscuit dough for instrumental texture measurements was used to standardise the pre-mix sample and form a 'dummy cake'. Its large compressing plunger replicated the forming process where the cake was produced. A ball probe was penetrated in to the patty to represent squeezing in the hand and measure sample firmness. Firmness - Optimisation of formulation to incorporate maximum water content but maintain consistent product texture. Consistency - Reduce down time in production caused by poor consistency of fish meat mix at point of forming. Elasticity / Yield Point - Improve finished product quality in line with consumer requirements and sensory perception. The method developed is quick, simple to follow, and, most importantly, representative of the production conditions imposed during manufacture. 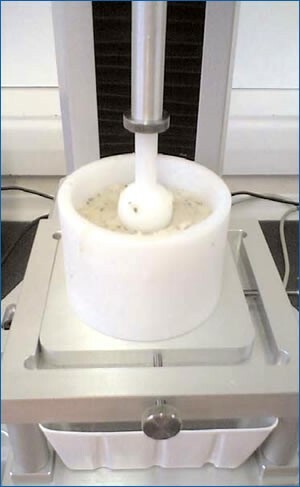 Reproducible sample preparation and selection is critical if accurate tolerance bands are to be applied in relation to moisture addition during mixing. Texture data are of greatest value when combined with a good historical knowledge of the manufacturing process. A preliminary detailed study monitoring the effect of moisture variation at all stages of production is essential. Knowledge must be generated relating to sample temperature and hydration times of potato starch so that tolerances can be set to accommodate all eventualities. 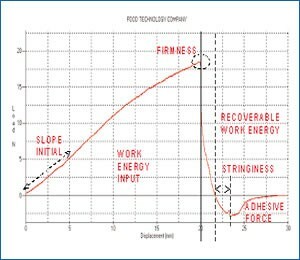 process should be made and tolerances applied at each relevant CQP.